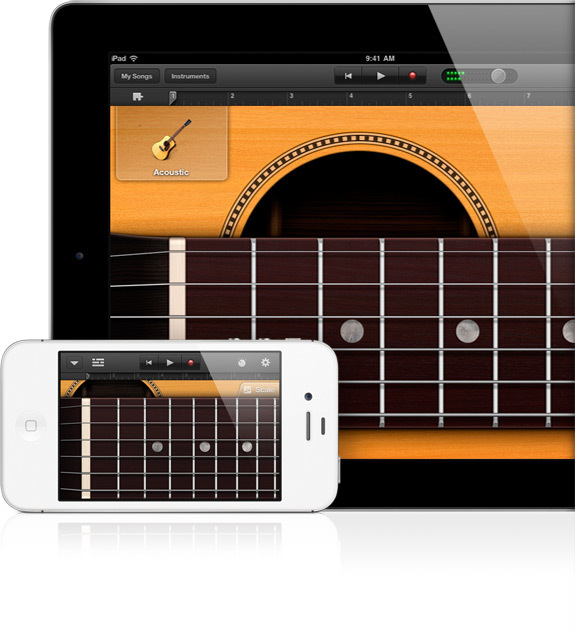 GarageBand App, Workstation, DAW or sequencer for iPhone / iPod Touch / iPad from Apple in the GarageBand series. Product replaced by the Apple GarageBand App 2. Apple has announced the release of a Garageband app for the iPad (and iPad 2). GarageBand is designed to turn your iPad into a collection of musical instruments and a recording studio. You can play a collection of Touch Instruments and Smart Instruments using Multi-Touch gestures, or create a song using an eight-track recording studio. Touch Instruments – Play a collection of musical instruments designed for Multi-Touch designed to sound and play like their real counterparts. Drums – Tap out beats on three acoustic drum kits. The snare, kick, toms, hi-hat, and cymbals each produce different tones depending on where and how hard you tap them. Drum Machines – Play electronic drum kits by tapping “drum pads” inspired by a classic drum machine interface. Keyboards – Select from several keyboards — a grand piano, an organ, a synthesizer — each with their own sound, look, and customizable performance characteristics. Hard taps are louder and soft taps quieter. Synthesizers – Play 70 modern and vintage synthesizer sounds — including synth strings, leads, basses, and more. Use the Arpeggiator to create melodies and soundscapes with a single finger. Smart Guitars – Strum chords on acoustic and electric guitars, trigger fingerpicking and strumming patterns, or tap out your own riffs and melodies. Smart Keyboards – Play a range of keyboard instruments by tapping on preselected chords that sound great together, no matter what you play. Smart Bass – Perform bass lines and grooves by tapping on strings, or switch to Notes view to play individual notes on a virtual bass neck. Smart Drums – Drag and drop snares, kicks, and hi-hats to create your own beats, and move them around to try out different patterns. Recording Studio – Arrange and mix your songs using an eight-track recording studio that can handle a combination of audio recordings, Touch Instruments, and loops. Tracks – Create a song by trimming and arranging musical regions where you want them to play. Swipe to reveal the mixer to fine-tune each track for the perfect mix. 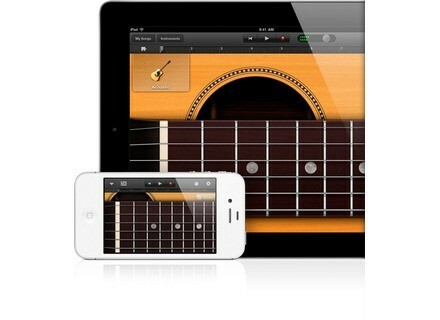 Guitar Amps – Plug a guitar into your iPad to access nine classic and modern virtual guitar amps. Touch gestures let you operate tone controls and a swipe switches you from one amp to the next. Stompbox Effects – Choose from ten stompbox effects. Add and reorder stompboxes on your own pedalboard. Audio Recorder – Record your voice or an acoustic sound using the built-in microphone on iPad. Then apply one of eight sound effects like Chipmunk, Robot, Telephone, Monster, and more. GarageBand for iPad will be available to purchase March 11, 2011, priced at $4.99 USD. Oszillos-Mega Scope v1.2 Benjamin Schulz has announced that Oszillos-Mega-Scope, his free BPM-synced oscilloscope with support for multiple inputs, has been ported to Mac OS X.
SPL & Brainworx Plugins for UAD-2 Universal Audio has announced a partnership with SPL and Brainworx to develop a series of plugins for the UAD-2 platform. Plektron Guitar Amp v1.2 Plektron has updated Guitar Amp to version 1.2.